Monitor and control temperature for heating and cooling applications with the Series TS2 Digital Temperature Switch. The Series TS2 offers twelve programmable functions to customize the unit to fit application requirements. Use the 15(5) Amp SPDT relay output to drive a motor, compressor, or fan. Designed with the OEM in mind, the TS2 offers the ability to configure multiple units with the touch of a button. Programming multiple units is quick and easy. Simply program one switch with the desired parameter settings and connect the configuration key (sold separately) to the back of the unit. Press the button on the configuration key and download the parameter settings. Connect the key to the other switches to upload the stored settings with the push of a button. The TS2 features set point adjustments, static defrost timing, compressor mean time, hysteresis, and ambient probe adjustment. Security protection is offered using a password code. 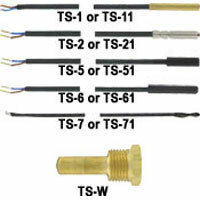 The Series TS2 Digital Temperature Switches are designed to operate with PTC (1000Ω @ 25°C) probes sold separately. Note: Minimum order of 50 pcs for configured models. -58 to 302°F (-50 to 150°C). PTC thermistor (1000Ω @ 25°C). 16 A SPDT relay @ 250 VAC resistive 5 A inductive. 115 VAC, 230 VAC, 12 VAC/VDC, or 24 VAC/VDC. 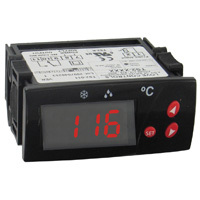 EXAMPLE TS2 0 1 0 Series TS2-010 Digital Temperature Switch, red display, 110 VAC supply voltage, degrees F.